The Fillmore District centered on Fillmore Street sports a very colorful past with some distinct markers in both San Francisco and United States History. This is a very condensed timeline with some events during these years singled out but dosen't necessarily consist of the most important events or only events for some people, but the events I found interesting. The information presented here is gleaned from many sources as listed below. Some of the events have links to further information should there be more interest. Flush with people and development, The City’s original street grid must expand and was extended west of Larkin Street and dubbed the “Western Addition” and thus flowed the Fillmore District of San Francisco. In flowed a diverse population of Jewish and Japanese immigrants. Stately Victorians rise and a commercial district is born on Fillmore Street. April 1906 marks the Great Earthquake which along with so much damage also resulted in a fire that burns for three days and leaves much of San Francisco demolished. Just days after the earthquake and fire, most of City Hall and Market Street department stores relocate to the closest geographical area that was left mostly intact - The Fillmore District. The Western Addition or more popularly referred to as The Fillmore District is very attractive to immigrants who can’t afford to live in The City’s more wealthy districts. The district flourishes with a very diverse population of Japanese, Jewish, Russian, Filipino, Mexican and African Americans. Three Synagogues, a Yiddish Cultural Center, dozens of kosher butchers, bakeries and apparel shops dot a bustling commercial part of Fillmore Street. Clashes between white supremacist groups, politicians and labor unions result in curtailed immigration from further laborers from Japan, yet the Japanese population continues to increase. 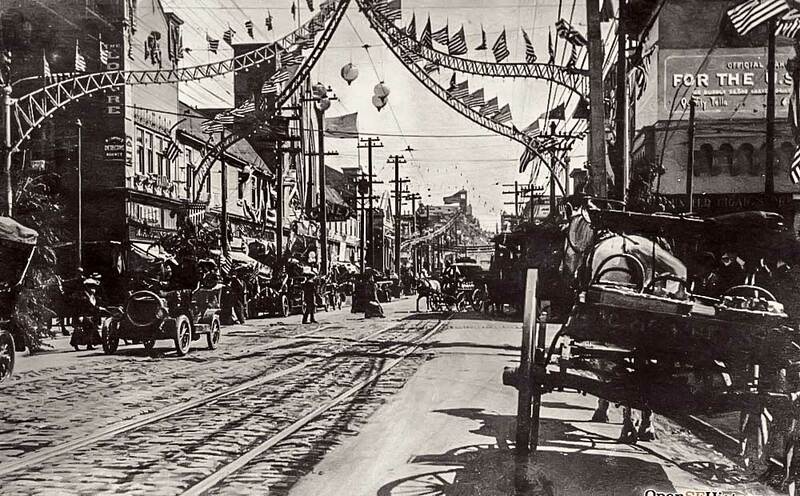 The Chutes comes to Fillmore, opening on Bastille Day, May 14, 1909, with a splash. Almost to the date, it opened, on May 29, 1911, there was a fire on Fillmore Street decimating the amusement park on Fillmore Street. A movement to totally exclude Japanese immigrants eventually succeeds with the passing of the National Origins Act of 1924. This legislation almost completely curtails immigration from Japan until 1952 when an allotment of 100 immigrants per year is designated. A few refugees enter the country during the mid-1950s, as do Japanese wives of United States servicemen. Japan bombs Pearl Harbor on December 7, 1941. Just hours after the bombing, the FBI descends on the Fillmore District and begins to arrest some of the more prominent members of Japantown. Just a little more than two months later on February 19th, President Franklin D. Roosevelt sets in motion the eviction and incarceration of approximately 110,000 Japanese Americans and immigrants and are moved to internment camps. A pivotable and embarrassing period in American history. Come 1943, the Fillmore Street arches are torn down to be melted in contribution to support of World War II. Midway through the ’40s with a growing African American population, a plethora of nightclubs begin to open along the Fillmore. A flourishing music scene comes to light and many Jazz greats from that time such as Louis Armstrong, Ella Fitzgerald, and Billie Holiday all played the clubs along Fillmore. IN 1945 the war ended and the Japanese were released but without any compensation for lost wages and their life. George W. Bush signed a financial restitution bill in 1990 and issued a formal apology for the injustice done. From the segregated Texas town of Mineola, Willie Brown traveled to San Francisco to attend San Francisco State University with the intent to be a math teacher. The Fillmore District is where Brown resided in those early years. Campus politics and the general landscape of politics in San Francisco at that time sent him in a different direction, later winning a seat in California’s assembly, becoming Speaker and in 1995 Mayor of San Francisco. Much goes on in redevelopment across America and many plans and monies are spent renovating the Western Addition or what’s now called the Fillmore District. The San Francisco Redevelopment Agency’s Western Addition Project is set to widen a busy Geary Boulevard to four lanes and later it becomes an invisible line between two parts of Fillmore Street in a financial, class and racially biased divide. The redevelopment agency creates plans for the Japanese Culture and Trade Center. It is to be located in Japantown and in the process many residents, estimated around 4,000 are displaced and move to nearby areas marked for further redevelopment project A-2. Much of the intent to help the poor with the redevelopment of the Western Addition was seen much different from the people already there. With the power of eminent domain, approximately 17,000 Fillmore District residents were displaced, moved or torn by the chaos of these plans. In 1963 Herman creates a plan - Phase A-2 - and designates around 60 blocks with a less than positive effect on more than the 13,000 Fillmore residents, thus fulfilling the negative aspect of his prophetic quote in 1960. Martin Luther King Jr. delivers his famous “I Have a Dream…” speech in Washington, D.C. The Civil Rights Act is signed into law by Lyndon B. Johnson. The Watts Riots take over parts of Los Angeles. December 10th - Bill Graham hosts his first concert at the Fillmore Auditorium. Riots begin in Hunter’s Point and spread to the Fillmore. Within a few days of the then Mayor, Jack Shelley calling in the National Guard the riots end. After much activism against the San Francisco Redevelopment Agency and Justin Herman, the agency creates “Certificates of Preference”. They are used to allow displaced businesses to return The Fillmore District. Sadly, it takes close to 20 years for the storefronts to be rebuilt and as of 1999, only 4% of those certificates had been used to rebuild, leaving an unfulfilled and negative legacy for many. Following an incident that began when a member of the Black Panther Party aimed a gun at a policeman. Alioto says, "I have pointed out for some time that we ought not to treat the Black Panthers as some kind of a political organization or some kind of a social organization. This is an organization that not only exhorts to the use of violence but trains in the use of violence." Justin Hernan’s and the San Francisco Redevelopment Agency’s plans to create a large commercial venture in the heart of the Fillmore District languishes as the financial investment to develop it is not forthcoming. This is after the agency had cleared about 60 square blocks and 10,000 residents - a troubled and disheartening result for all. A heart attack ends the life of Justin Herman the next year. An abandoned synagogue adjacent to the Fillmore Auditorium is rented by a charismatic preacher,/cult leader Jim Jones, which he dubs, “The People’s Temple.” The cult was formed by Jones in Indiana and moved to San Francisco after having a less than positive acceptance in Indiana. Several years later this same preacher creates an International tragedy after moving over 1,000 of his members to a commune in Guyana. From a major political effort put forth by Mayor Diane Feinstein, on the vacant land in the Fillmore District, The Fillmore Center is built, which includes hundreds of apartments, condominiums, stores, and restaurants is built. In a bitter twist, most of the former inhabitants of the Fillmore District are unable to afford to live there. The invisible line on Fillmore Street at Geary is now made even more prominent and to this day by the financial differences of the residents on either side of Geary Boulevard. One side thrives while the other is disadvantaged and riddled with crime. The San Francisco Redevelopment Agency comes in again to try to revitalize the Lower Fillmore and begins by creating The Old Fillmore Jazz Preservation District. The intent was to resurrect the vibrant time on Fillmore where the jazz clubs thrived and add a movie theatre. Financial woes to secure new development investors and secure a cinema chain and jazz clubs. Yoshi’s Restaurant and Jazz club opens and some of the area is revitalized, however, Yoshi’s and other clubs haven’t hung on. Once again the Fillmore District has taken a new turn and has quickly become The City ’s top shopping district behind only Union Square. Many high end and trend-setting businesses have moved into the district providing attractive opportunities in sync with the increase of income from the Tech community flowing from Silicon Valley into San Francisco and the increasing cost of homes and apartments that can support these types of businesses. These new additions to Fillmore Street bring creativity and color to the popular district.